Japan Marks 'Restoration Of Sovereignty' For The First Time : The Two-Way The day marks the end of the allied occupation of the country following its defeat in World War II. The day was an election pledge by the prime minister, who in recent weeks has adopted a more hawkish security stance. 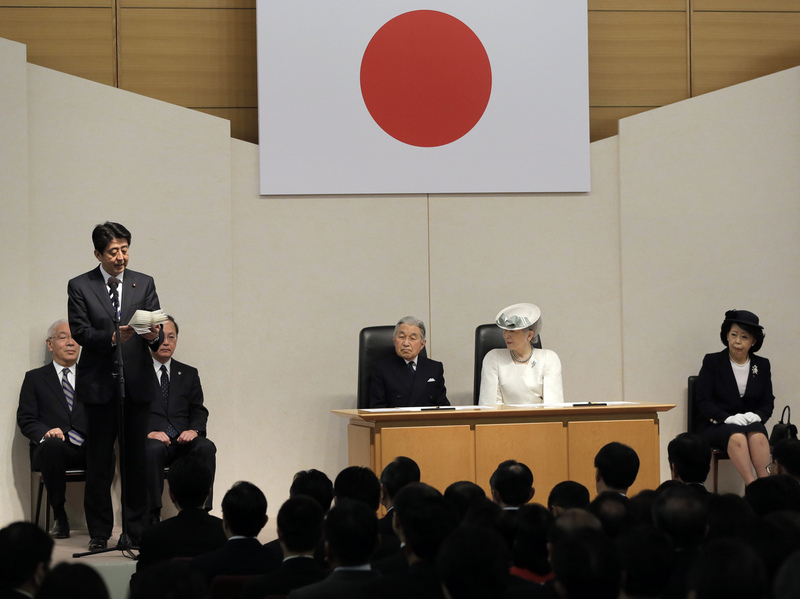 Japanese Prime Minister Shinzo Abe delivers a speech Sunday in Tokyo as Emperor Akihito, third from right, and Empress Michiko, second from right, listen during a ceremony marking the day Japan recovered its sovereignty under the San Francisco Peace treaty in 1952. "The prime minister has devoted greater attention in recent weeks to a more hawkish stance on security and Japanese history ahead of a July upper house election that his ruling bloc needs to win to cement its grip on power. Abe has defended the visits in the past week by more than 160 lawmakers to the Yasukuni shrine, which honours Japan's war dead but offends neighbouring countries because it also honours Japanese war criminals." The campaign comes amid growing nationalism in Japan. As the Asahi Shimbun reports, nationalist groups have targeted ethnic Koreans in Tokyo's Korea town. Separately, Japan and China are also involved in a standoff over uninhabited island in the East China Sea. Sunday's Restoration of Sovereignty Day ceremony was marked by protests in Okinawa, which remained in U.S. hands until 1972, and which now plays host to U.S. troops. "April 28 is considered the day when Japan, with the San Francisco Peace Treaty, recovered its independence while keeping Okinawa in the prison of the U.S. military," Norio Motomura, an activist from Okinawa, told Japan Times. People on the island labeled the ceremony a "humiliation" for Okinawa.